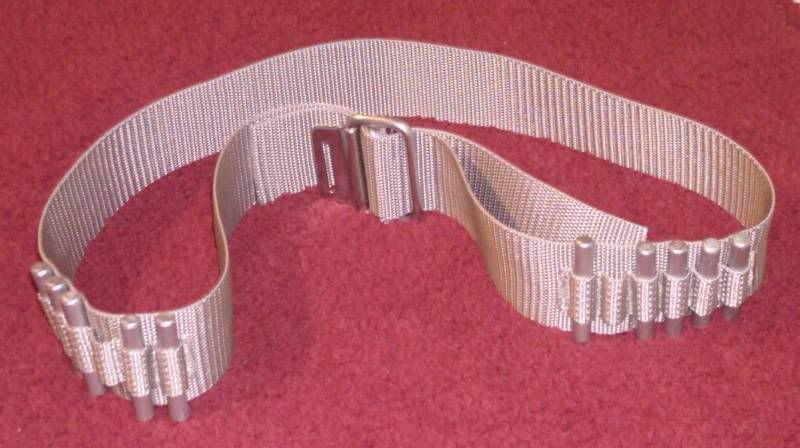 Do the ejection straps include a section that goes around the waist like a belt? The costume tutorial photo show the straps and a 'belt' made of the same material yet the guide to make them does not show this 'belt'. How should I plan to make this part? Please read through existing threads, like this one http://www.rebellegion.org/forum/viewtopic.php?t=10405 so we don't have to repeat ourselves. It might be worth making this a 'Sticky' topic to help us new folks. I got my straps from Richies Armor. The belt part that goes around the waist is a seperate piece that's not attached to the leg straps...at least in my case. Actually the belt that I have was taken from a luggage strap that people tie around their suitcases, and I took off the end pieces and had them re-sewn around an after-market seat belt mechanism. I don't think the 100% canon buckle works for a guy with my waste line and the seat belt mechanism snaps open and closed so it's quick and easy. If needed you can actually find grey nylon webbing (sometimes they operator will actually ask if you're making an x-wing pilot costume...I think the word is getting out). If you like slide on over to echo base rebels "So You want want to be an x-wing pilot" tutorial. it's got some great info. Also, don't be afraid to post questions on the pilot forums. We're always glad to see more orange. That's a great link and I've been referencing it a _lot_. I went ahead and ordered enough webbing for a belt but may not use it. I'm still contemplating a holster with gun and don't know if 2 belts would look right. Well, if you browse around the pilot forums you might see that new standards being debated would require a seperate holster belt for a blaster if you do wear a blaster, which isn't necessary for the costume but people like to have one, myself included. If need be I'll just wear my black leather belt I wear for my jeans. Some people get really nice holsters done. Currently I wear my holster, which just has two belt loops, on my webbed belt, and I'm doing so until I hear different. Wonderful ...he probably has Aldreaan on the "Axis of Evil" as well. Yeah, I placed an order with Strapworks and they called to say they were out of the nylon. She recommended an alternative called 'Polypropylene webbing' that is very similar and cheaper. This is what a belt looks like, made out of the polypropylene. I made my ejection straps out of a boat winch strap that I bought years ago. It's a bit darker, but it's very similar to seat belt webbing. I, too, had to use the polypropylene webbing for my straps from the shortage. It has a slightly different texture, and I think it might be a tad more stiff, but in my opinion is an excellent option. "If I knew what I was doing, it wouldn't be called research"
I'm going to place the order tomorrow for the polypropylene straps. ditto. and in my case they actually just sent me that without even asking. i hadn't realized there was a substitution until others mentioned the shortage. i think the polypropylene works out fine.